The con is here and so is the schedule! Pull out your tablets and fill up your weekend with panels, cosplay, games, and shopping! View the 2018 schedule here! 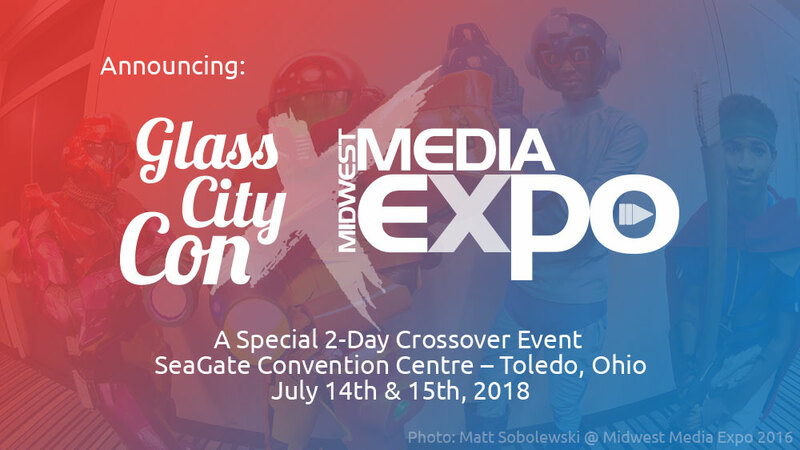 Glass City Con & The Midwest Media Expo have merged to bring you a special event this July! Since 2009, Glass City Con has been the premier Japanese animation convention of Toledo. Since 2014, the Midwest Media Expo has been redefining the meaning of Pop Culture Experience. We are proud to announce the fusion of these two great events. From July 14-15, join us as we combine forces to bring you fun and entertainment from the far reaches of fandom. Only a 10-minute trek from the Michigan border, our merged event has something in store for you. Online Registration for 2018 is now closed, but tickets are available at the door. This year's special Glass City Con X Midwest Media Expo will be held at the SeaGate Convention Centrein Toledo, Ohio. We've partnered with the Park Inn by Radisson Hotel to offer a special rate of $102/night to GCC / M2X attendees! Limit 4 child registrations per adult. GCC X M2X will be an all-inclusive event, and we take great pride in this. Most activities, such as our game rooms and celebrity autograph sessions, are available to attendees at no additional charge. We also have a handful supplemental activities such as gaming tournaments and charity fund-raising activities, which do require a small additional fee to participate; however, we do not take an additional profit from these events. What special guests of honor can I expect to see at the Media Expo? Will there be an extra charge to meet them? You can expect some of your favorite actors, artists, internet personalities, authors, musicians, and much more at the event. A few fan favorites from our other events may also attend. Eager to show off your latest cosplay creation? We can’t wait to see it, but we do have a few guidelines to follow to keep everyone safe. Also, if you’d like to participate in our Cosplay Masquerade, those rules are also available now. 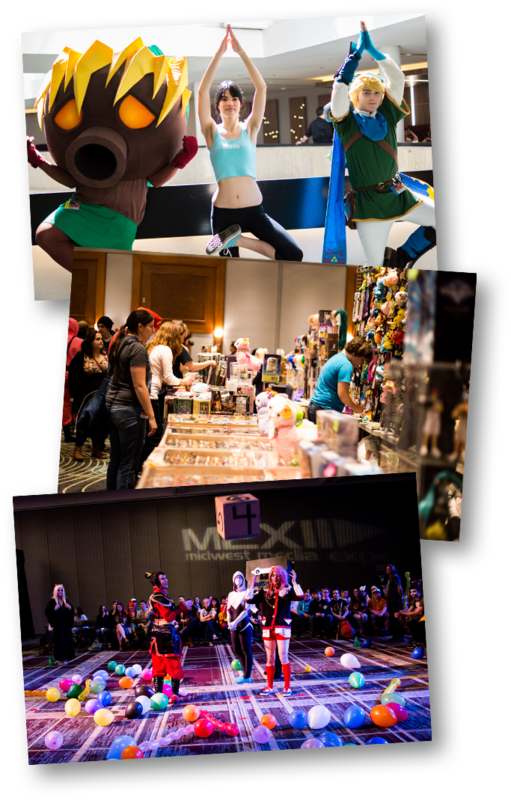 The Panel Application for Glass City Con X Midwest Media Expo is now available! © 2013 - 2018 Youmacon Enterprises / Defying Conventions. All rights reserved. Youmacon "U-Flame" and the flame icons are trademarks of Youmacon. The "Steampunk Gear" icon is a trademark of World Steam Expo. Pause/Play icon and the Midwest Media logo are trademarks of the Midwest Media Expo. All photos on this website were taken by staff photographers at The Midwest Media Expo 2014 - 2016, or provided by their owners. As many are now aware, the Midwest Media Expo has unfortunately had to postpone it's 2017 event. However, we have been able to relocate to a newer venue and are hosting an event for the community in it's place. What we have for you is 3-day event starting Friday afternoon and goes through Sunday. The great part: we are bringing you our day festivities for FREE. The support that the community has shown us over the past few days has been amazing and we want to give you all a great event. We have guests, programming, concerts, vendors, cosplay gatherings and more, all lined up for you. The event page and the Midwest Media Expo page itself will be updating with information as it arrives. Current attending guests include musicians mc chris, and Fox & Pepper, as well as voice actors Jon St. John, David Eddings, and Bryan Massey. There is a small cover for the concerts and dances(dance admission included in concert price), and everything else is free to the community. Hotels are going fast, please check out our Facebook page for details. Thank you again, one and all. We look forward to seeing you this weekend.